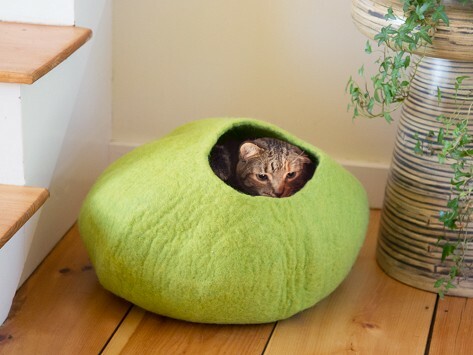 Let your cat snuggle up and sleep in this all natural cat cave and back a noble cause while you’re at it. Crafted of sustainably sourced boiled wool, its natural temperature regulating properties will keep them feeling just right season to season. Le Sharma practices Fair Trade—providing local Nepalese women with safe work conditions and a steady income to send their kids to school. Fits cats up to 18 lbs. My cats love it. It looks so much better than anything else we’ve tried. great item. cat loves it. recommend to any cat owner. My 2 cats love to cuddle up in the cave and sleep! 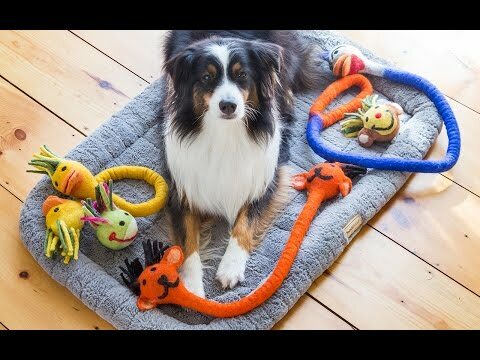 Not only are these natural toys fun for your pet, they’ll make you feel good, too. Each one is made by women in Nepal for fair wages, providing jobs that change their lives. Based in the Mt. Everest region of Nepal, Le Sharma Trading gives local, steady jobs and safe work conditions. This benefits their families, too, helping send their kids to school. Handcrafted and sustainably sourced, each toy is made from felt wool that’s all-natural and safe for pets. Besides working out their jaws, the tug toys and balls help clean dogs’ teeth. And the cat caves regulate temperature season to season, providing a soft, cozy shelter year-round. Each toy is biodegradable, too. So while you’re helping far-away families, you can also feel good about protecting the planet.